Particulates, or particulate matter (PM), refer to any mixture of solid particles or liquid droplets that remain suspended in the atmosphere for appreciable time periods. Examples of particulates are dust and salt particles, and water and sulphuric acid droplets. The length of time a particle survives in the atmosphere depends on the balance between two processes. Gravity forces the particles to settle to the earth's surface, but atmospheric turbulence can carry the particles in the opposite direction. Under normal conditions, only particles with diameters less than 10 micrometers (μm) remain in the atmosphere long enough to be considered atmospheric particulates. In quantifying particulate matter, it is typical to give the mass of particles less than a particular size per cubic meter of air. For example, 10 μg/m 3 PM 2.5 means that in 1 cubic meter (m 3 ) of air the mass of all particles with diameters less than 2.5 μm is 10 μg. Adapted from U.S. EPA, "Air Quality Criteria for Particular Matter." Available from http://www.epa.gov/ncea. 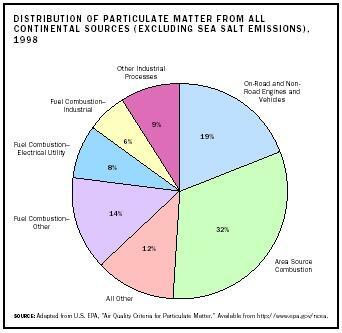 Most atmospheric particulate comes from natural sources and is mainly dust or sea salt from mechanical processes such as wind erosion or wave breaking. Although most of this material is of large size and so is lost from the atmosphere by gravitational settling, many of the smaller particles can travel very long distances. For example, dust from Saharan dust storms is carried across the Atlantic Ocean and can be detected in Florida. Similarly, dust from Asia is regularly detected in Hawaii and sometimes even continental North America. Adding to the naturally produced dust is a small but often locally important contribution from the photochemical oxidation of naturally occurring gas-phase hydrocarbons, such as alpha and beta pinene, emitted by trees. These particles frequently give forested areas a hazy atmosphere. Although natural processes produce most of the atmospheric particulate on a global scale, anthropogenic processes are the source of most particulate in urban or industrial areas. The major anthropogenic sources are those that increase natural loading, such as extra dust due to agriculture or construction. However, a significant amount of particles are present in factory, power plant, and motor vehicle emissions, and produced from the reactions of anthropogenic gases present in those emissions. Primary emissions are those that are produced before being released into the atmosphere or immediately afterward. They result from condensation that follows the rapid cooling of high-temperature gases. An example is the soot that comes from diesel engines. Secondary particles are produced over a longer time period and derive from gas-phase chemical reactions that produce low-vapor-pressure (condensable) products. This process is especially important, as it produces the ultrafine particles (0.01 μm) that have been shown to be closely related to human health effects. An example is the atmospheric oxidation of sulphur dioxide to sulphuric acid, in which sulphur dioxide is a gas but sulphuric acid exists in the form of droplets. Particles are an environmental concern because they lower visibility, contribute to acid rain, and adversely affect human health. Particulate suspended in the atmosphere has diameters similar to the wavelengths of visible light, which makes it very good at scattering this light. In the presence of particulate, scattering reduces the light coming from distant objects, making it more difficult to see them. This loss of visibility is particularly important in areas that rely on clear vistas to attract tourists. Sulphur dioxide emitted from fossil fuel combustion is oxidized to particulate sulphuric acid or sulphate, which is a major component of acid rain. Particles can be a major irritant to the human bronchial and pulmonary systems. The body has natural mechanisms to limit the penetration of these particles into its sensitive areas. The nose is an effective filter for particles of greater than about three μm, and blowing the nose expels these. Smaller particles can penetrate deeper into the bronchial passages where mucous layers and small hairs called cilia catch the particles, which can then be expelled by coughing. The smallest particles, however, may penetrate all the way into the lungs. Irritation of the lung and bronchial tissue by particles prompts the body to produce mucous in self-defense, which can exacerbate existing respiratory problems such as bronchitis and asthma. There is also concern that harmful pollutants in, or attached to, the particles may be absorbed into the body. Heavy metals and carcinogenic polycyclic aromatic hydrocarbons ( PAHs ) from combustion can be introduced into the body in this way. Most jurisdictions have, and are continually updating, air-quality standards for particulate matter. In 1997 the U.S. Environmental Protection Agency (EPA) added a new annual PM standard of 15 μg/m 3 2.5 and a new 24-hour standard margin of 65 μg/m 3 , while retaining the annual PM 10 standard of 50 μg/m 3 and making minor technical changes to the 24-hour standard of 150 μg/m 3 . Approximately 29 million U.S. citizens live in areas that do not meet the PM 10 standards, but because of the need for three years of monitoring and the requirements of the clean air act, nonattainment areas for PM 2.5 have not yet been determined. The standards in most industrialized countries are similar to those in the United States. Many countries have large areas that exceed the local air-quality standards, and thus they have instituted control programs to reduce particulate levels. Fortunately, many of the strategies in place to combat smog, acidic deposition, and smoke releases are also effective in reducing particle levels. Most countries now have integrated strategies to reduce common emissions (e.g., nitrogen oxides and hydrocarbons) that contribute to particulate matter, acid deposition, and smog. SEE ALSO A IR P OLLUTION ; A STHMA ; D IESEL ; S CRUBBERS ; S MOG ; V EHICULAR P OLLUTION . U.S. Environmental Protection Agency. "Air Quality Criteria for Particulate Matter." Available from http://www.epa.gov/ncea .